Writer J. M. Coetzee’s early poetry is almost undecipherable. That’s because it was written in computer code. In the mid 1960s Coetzee was working on one of the most advanced programming projects in Britain. During the day he helped to design the Atlas 2 supercomputer destined for the United Kingdom’s Atomic Energy Research Establishment at Aldermaston. 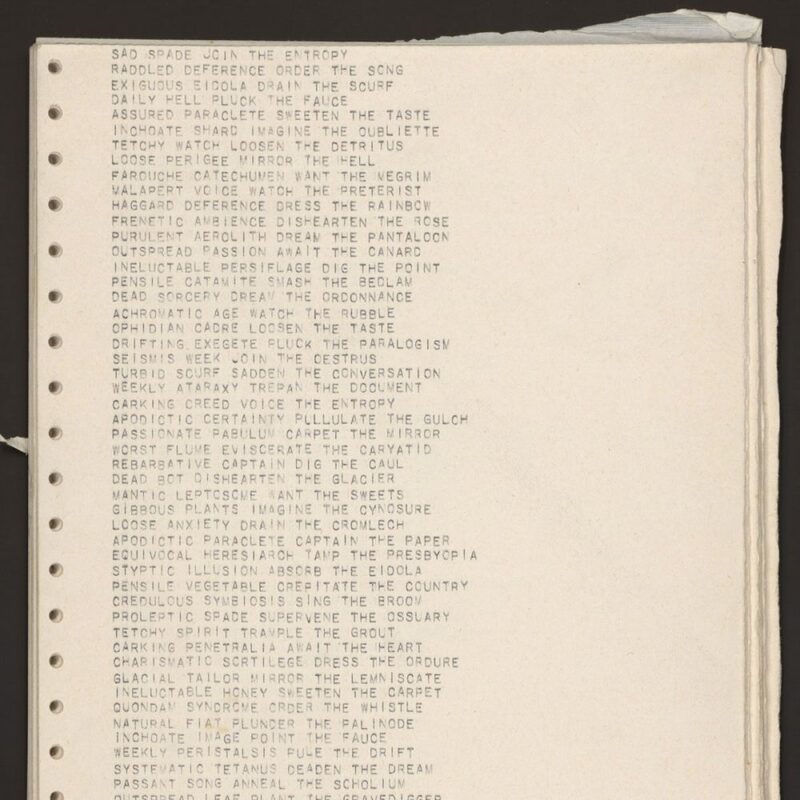 At night he used this hugely powerful machine of the Cold War to write simple “computer poetry,” that is, he wrote programs for a computer that used an algorithm to select words from a set vocabulary and create repetitive lines. Coetzee never published these results, but edited and included phrases from them in poetry that he did publish. While Coetzee was never quite at risk of starting World War III, these important experiments have gone under the radar of both Coetzee scholars and historians of computing are concerned. Readers of Coetzee may be familiar with these experiences from their description in his second “fictional autobiography,” Youth (2002), but Coetzee’s role in the Atlas 2 project and his sustained interest in computing across his academic and literary career have been largely ignored. 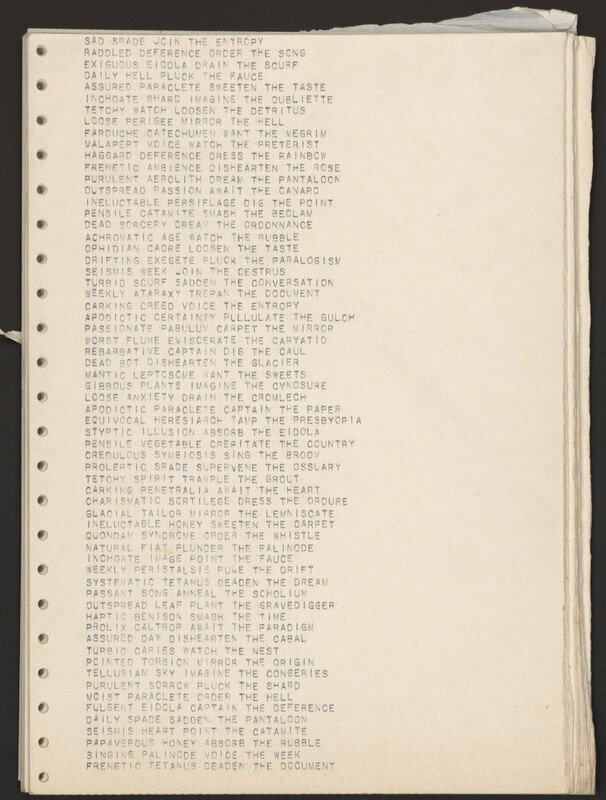 A page of J. M. Coetzee’s computer code poetry, dated May 30, 1965. While at the Ransom Center I was able to examine print-outs testifying to Coetzee’s poetry generation on the Atlas 2. I say examine because reading them entailed a steep learning curve on my part: some were written in binary and hexadecimal number strings. This individuated “machine code” is designed to instruct the computer, but is difficult for programmers to read and proved almost incomprehensible to me. Other documents were written in FORTRAN, the first high-level programming language, developed in the late 1950s as a language that was easier for human users to write and read, but could then be easily “translated” via a compiler into machine code. Still others were written in FORTRAN “pseudocode,” an idiosyncratic form of notation that a programmer such as Coetzee might develop (a sort of personal shorthand) that resembles FORTRAN but is not executable. Excitingly, I also was able to examine Coetzee’s born-digital materials, recovered from 5.25” and 3.5” floppy diskettes. This was invaluable, and enabled me to begin to establish a timeline of what kinds of computing hardware and software Coetzee was employing across his writing career. I am extremely grateful to the Center’s digital archivist Abby Adams for devoting so much of her time both before and after I arrived to making this collection available. Without her help, my research would have been restricted to consulting print-outs of such digital materials—useful, but less than ideal! Thanks to her I was able to establish many of the file types of Coetzee’s records, which will help me to determine the software on which he wrote the majority of his novels. While these are still early days for this research project, having access to Coetzee’s electronic files, programming records, and output has prompted a number of fascinating challenges and research questions: How do you read code? What is the “text” of a program—the machine code, the high-level programming, or the output it generates? How do you preserve an electronic file and how should the scholar access it? As more and more writers produce born-digital archives, these questions will only become more urgent, for archivists and for literary scholars. Looking at Coetzee’s other career will, I hope, help to clarify some of these issues. Rebecca Roach is a postdoctoral researcher at King’s College London. Her current book project, of which her work on Coetzee is part, is titled “Machine Talk” and explores communication and collaboration in digital literature. Her fellowship at the Ransom Center was supported by the Andrew W. Mellon Foundation Research Fellowship Endowment.